Vibration exercise platforms make some pretty bold claims. It’s alleged that they can make you healthier, faster and stronger without you having to do anything, really. This does make one slightly skeptical-however some research studies do actually bolster these claims. Vibrating exercise platforms have been implicated as effective treatments for certain health problems, including back injuries. Manufacturers claim that the vibrations caused the skeletal muscles in the human body to contract and stretch. This engages more of your muscles than exercise voluntary movements do. It is claimed that 10 minutes on one of these vibration plates is equivalent to 60 minutes of actual exercise. While there may not be a scientific consensus yet on the true benefits of these exercise machines-it makes sense that they can be an effective component of an overall healthy lifestyle. 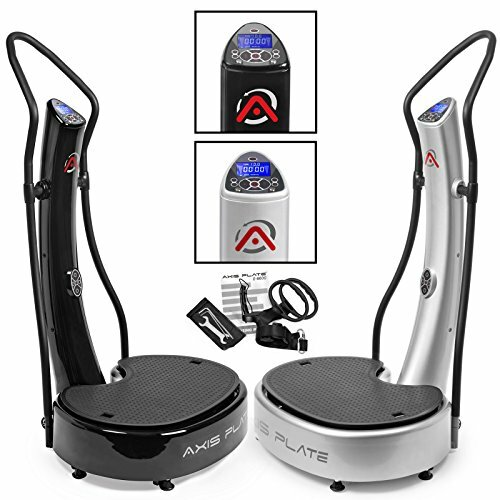 Let’s take a look at some of our favorite vibration platform fitness machines. Does whole body vibration and passive exercise actually work? How does whole-body vibration work? What do the medical experts say about passive exercise? What do the scientific studies say? How can whole body vibration help those over 65? What is whole body vibration exercise? 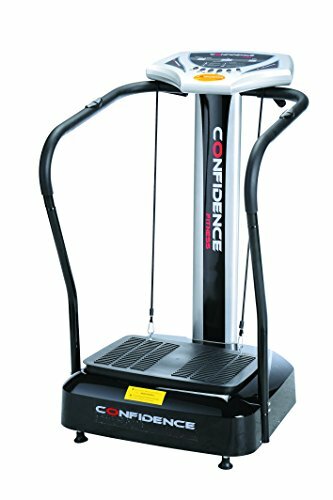 Improve your general wellness with the help of this Confidence-brand vibrating fitness machine. It is designed to improve blood circulation, increase bone density and lessen cellulite. It works by creating a high frequency vibration that causes a stretch reflex in the body. It is fitted with yoga straps for optimum effect in the different muscle groups. A 10-minute use of this machine is already equivalent to 60 minutes of regular exercise. With a maximum weight capacity of 300 pounds, this machine could potentially different results depending on your body weight. Users with joint or heart conditions are recommended to seek medical advice prior to using one of these vibrating platforms. Another good option is this Merax Vibration Platform. It is ideal for muscle toning, cellulite reduction, muscle building and weight loss. It is designed to have 10 preset programs for adjusting the speed range and intensity of the vibration. Operating this machine is easy as it has a user-friendly console with a window display screen. It comes with yoga straps that work for the arms and the upper body. Movement options also include linear, oscillating and plinar. While many users are happy with this machine, one of the main drawbacks is that it does not come with instructions on how to use it. Increase your muscle mass without spending much on expensive gym membership with the use of this vibration plate. This machine also works for reducing cellulite, fat, stress, and fatigue. Spending at least 10 minutes on this machine feels like doing an hour of conventional workout. However, anyone with a joint problem or heart condition should not use this machine without asking for medical advice. Assembling this product will not be a problem as it is easy to put together. It is also easy to operate. However, some users have reported that its vibration speed is a bit slow for their preference. 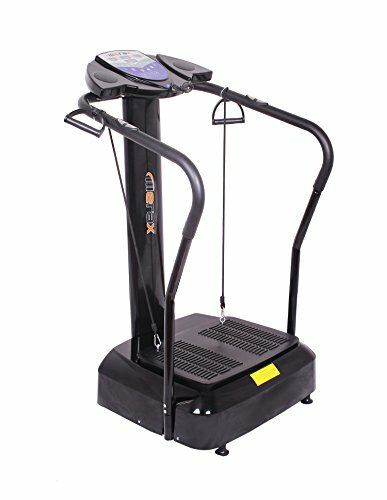 This dual-motor vibration machine of 1500 watts whole body vibration machine is another solid option. Strong customer feedback is a reassuring indication of its ability to improve the general fitness of its users. Among its notable features are 60-speed settings, 3 user-programmable workouts, 3 pre-programmed workouts and a BMI analyzer. Its speed and motion can be adjusted while you are in any position because of its dual control panel. It can support a person with a maximum weight of 400 pounds. The vibrating plate measures 27.25 x 20 inches. One drawback is that it has received several complaints for the odor of its rubber mat. Most users place it outside their home to minimize the smell. This is another exercise machine that is great for muscle building and toning. It has received solid across-the-board ratings from its customers. Its overall dimension measures 33.5 x 17.7 x 5.5 inches in length, width and height, respectively. Users also find it helpful in weight loss and cellulite reduction. Among its features are dual motors, yoga straps and an input for MP3 players, iPods and USBs. Its speed range has also 99 levels and it is designed to provide oscillation and horizontal movement. It is also fitted with overload protection and static electricity resistance capability. The retractable foot of this machine keeps it balanced in case of uneven surfaces. However, its main drawback is that the user guide doesn’t provide clear direction on how to use this machine for optimum results. You can always check out user forums and YouTube videos to get a sense of how best to operate this excellent machine. Passive exercise is a trending fitness concept that is based on the notion that you can work out without actually working if you have certain type of equipment doing the work for you. The vibration platforms that we have reviewed here deserve their own passive exercise category. They’re based on the concept of whole-body vibration (WBV). The idea originated in Russia, where cosmonauts used it as an outer space preparation exercise. In general, you will stand on the exercise platform with their knees usually bent at around a 30° angle. The vibration surface will then the vibrate beneath your feet at around 30 times per second. This high-speed vibration tricks the body into making you think that you are falling. This will activate a stress reflex which stimulates rapid muscle contraction. 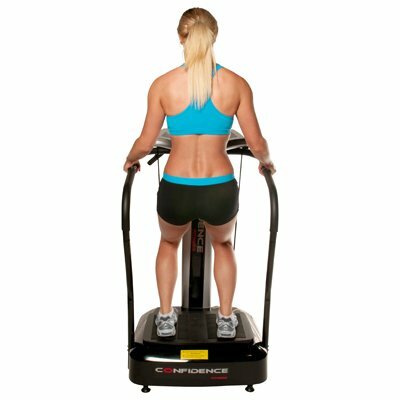 These muscle contractions are the primary way these machines provide their exercise benefits. Some other interesting health claims include enhanced metabolism, human growth hormone elevations, additions to bone mineral density as well as an enhanced lymphatic flow. For individuals that are disabled, or otherwise suffering from health and mobility restrictions that prevent them from exercising, things like multiple sclerosis, arthritis or even Parkinson’s, the muscle toning exercise please devices provide can sometimes be useful. Of course, you would need to consult with a physician prior to using these vibration machines if you are suffering from a serious medical condition. Whole body vibration can be beneficial, but as usual, the manufacturers have overstated their case, somewhat. Medical practitioners have commented that vibration platforms can have great effects on bone density, even better than conventional exercising, as well as improving circulation and providing muscle stimulation for individuals who cannot practice traditional exercise. They do doubt that it is an effective means of weight reduction for cellulite elimination. A research study that was published in the Journal of the American Geriatric Society discovered that elderly individuals who were unable to practice traditional exercise demonstrated improved muscle strength and movement speed from using a vibration platform exercise machine. Another study that was presented in the proceedings of the national Academy of sciences actually examined its effect on mice. The mice were subjected to a low-vibration surface five days a week for 15 minutes at a time. The mice who were in the experimental group ended up with smaller torsos than the control group who did not receive the vibration platform, even though both sets of mice the same amounts of food. The consensus seems to be that vibration platform exercise machines cannot replace traditional exercise but that they can be a useful and healthy supplement to it. A research study commissioned by the government of Spain found that whole body vibration training was able to promote muscle growth as well as increase the fitness levels of elderly study participants. Reuters reported on the findings saying that individuals who participated in the vibration exercises demonstrated increased ability to perform upper and lower body strength exercises, demonstrated nearly half an inch improved lower body flexibility, as well as being able to walk 33 yards a second faster than they had been able to prior to the vibration intervention. There have been some other research investigations that were able to statistically prove meaningful gains in muscle performance in individuals who had mobility impairments. 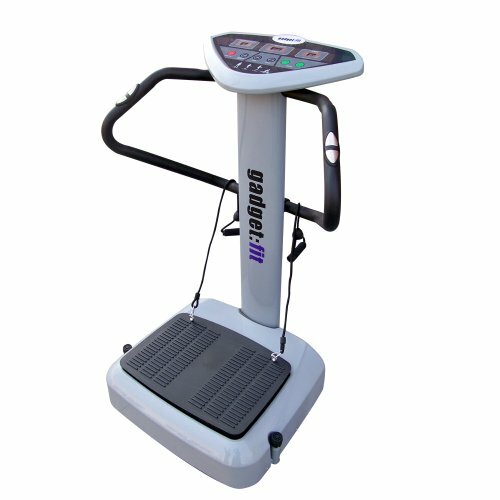 A Belgian study investigated the effects of vibration machine exercise on elderly individuals and found an increased quality of walking, significant decreases in pain, boosted overall health, drastic improvements in equilibrium, as well as improvements in overall physical vitality. A study conducted by the Medical College of Georgia found that vibration therapy was able to promote improved bone density in the mice they used in the study. It was hypothesized that the vibrations were able to stimulate cell nucleus movement which then triggered releases of osteoblasts that build bone. Another important aspect of vibration training is its ability to prevent muscle wasting, since it stimulates the fast muscle fibers. This interesting form of passive exercise rose to public attention in the 1960s. Back then it was a form of exercise that was used to keep cosmonauts fit while they were in space and there was no gravity. Going back even farther, you can find some evidence of vibrational exercise with the Greeks. It is unlikely that the ancient Greeks foresaw that vibrational exercise would enable astronauts to maintain adequate levels of fitness while in and before their sojourns to outer space. It is an important component of space travel as it prevents astronauts from experiencing muscular atrophy. The pulsing vibrations stimulate the muscles and prevents them from developing muscular atrophy, which can be caused by the highly sedentary and gravity-less environment of deep space. Whole body exercise like this is actually a form of passive exercise. Passive exercise can be defined as exercise that occurs without a tremendous amount of actual physical loser ocean performed by the individual. Three different types of machines can help you to perform passive exercise. The first is called a Chi machine, the second is called a whole body vibration platform, and the last is electronic muscle stimulators. All of these medical and exercise devices perform different functions, but they share in common an ability to strengthen and tone the human body. There is some skepticism on behalf of medical experts who are inclined to disparage their ability to replace exercise overall, but if you are mainly interested in using these devices as a supplementary form of exercise, there should be no issue with that. One other strong recommendation that passive exercise enthusiasts make is that you should consult with a physician prior to undertaking whole body exercise, or any other type of passive exercise. If you aren’t sure about whether to purchase one of these vibration exercise platforms- head over to Amazon and read some of the customer reviews. This is a great way to get a sense of what other people who are currently using these devices think about them. You will find a vibrant forum where purchasers are willing to answer questions about the equipment, honestly discussing their pros and cons. There is perhaps no better way of getting a true assessment of their viability for you and your personal requirements. The 5 Best Mentadent Toothpaste | Discontinued? The 5 Best Flat Tummy Teas | Does This Weight Loss Tea Work? 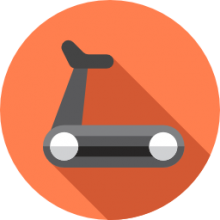 We are a team of product researchers that specializes in assembling comprehensive buying guides. Our team has a variety of backgrounds, with a mixture of soft and hard sciences represented. Check out our About page to read more about our reviews and editorial process. If you decide to make a purchase through one of the links on this site, I receive a commission for it. This doesn’t cost you anything additional. These commissions help to keep the rest of my content free, so thank you! Top5Reviewed.com is a participant in the Amazon Services LLC Associates Program, an affiliate advertising program designed to provide a means for sites to earn advertising fees by advertising and linking to amazon.com. Important Disclaimer: The information contained on Top5Reviewed.com is intended for informational and educational purposes only. Any statements made on this website have not been evaluated by the FDA and any information or products discussed are not intended to diagnose, cure, treat or prevent any disease or illness. Please consult a healthcare practitioner before making changes to your diet or taking supplements that may interfere with medications.